The next event might not have much of a successful outcome in comparison but it is a straightforward illustration of how our actions are destroying the earth. Let’s hope we learn from this tragedy. The image above shows satellite images of the Aral Sea, once the fourth largest lake in the world (the first image was taken in the 1970s). 1960- The Soviet government decided to divert water from the Amu Darya and Syr Darya. Instead of flowing into the Aral Sea, the water from the 2 rivers were channeled into the surrounding areas, with the aim of providing irrigation for agriculture (especially cotton plantations) in Uzbekistan and Turkmenistan. This led to a steady decline in the Aral sea levels. With its water sources cut off, the Aral began to dry up and recede. The small freshwater lakes surrounding the sea disappeared. Water conditions of the Aral went downhill as salinity levels increased and chemical fertilizers and pesticides runoff from the plantations polluted the water. As the sea continued to dry up, chemical pollutants that settled on the seabed soon got exposed and its dust blown around by the wind.This posed as a health hazard to the people living there and polluted the surrounding soils and croplands (requiring even more water for agriculture). The climate began to change; the rain stopped, the grass dried up and summers and winters became extreme. The fishes in the Aral died and communities that depended on fishing lost their livelihood. 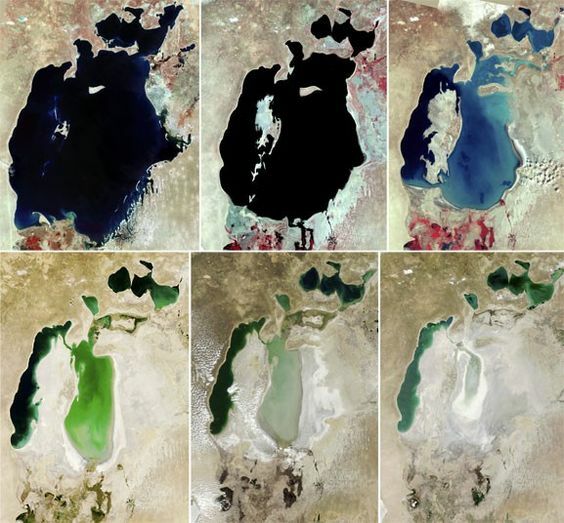 1987- The Aral continued to dry up and eventually split into two separate water bodies (third and forth picture)— the small one being the North Aral Sea and the large body being the South Aral Sea. By 1990, salinity of the water was around 376 g/l (normal seawater is around 35 g/l). 1988- At this point, Uzbekistan was the world’s largest cotton exporter. 1998- By this time, the Aral sea’s surface area had shrank by about 60%, and its volume by 80%. 2003-The south Aral split into eastern and western basins. In an effort to save part of the lake, the Kok-Aral Dam was built, cutting off the southern parts of the Aral to allow more water to flow to the northern parts. The following years saw some increase in the water levels in that part of the lake. 2014- The eastern part of the Aral dried up completely (it was originally the center of the Aral!). This leaves a thin strip of the Small Aral (north) and the western basin. In sum, we lost more than 90% of the Aral Sea within the last 50 years in order to satisfy our own human wants, and thus are responsible for the climate and geographical changes that occured in the Aral.